Forged with compassion, creativity and ingenuity, the mutually rewarding relationships we share with donors, partners and volunteers are a constant source of resources and strength for refugees and immigrants. Ernest M. Haddad, the retired General Counsel of Partners Healthcare, served on the Board of Directors of the International Institute of New England from 2002 to 2011, but his connection to the Institute began with his parents. In the early 1950s, his father, Abraham, a small businessman, became the first Arabic speaker on the Institute’s Board. His mother, Elaine, was an active member of the Syrian Women’s Club into her late 70s, and he distinctly remembers attending the Institute’s annual ball as a teenager. Ern’s father was just an infant when he was brought to the U.S. from what is now Lebanon; his mother was a teenage immigrant from Damascus. So when Ern was asked to join IINE’s Board, he was thrilled to help lead an organization that had meant so much to his family. During his tenure, he helped update the governance and bylaws of the organization and bring in strong new leadership. Your financial commitment will have a lasting impact on the lives of immigrants and refugees resettling in New England. To make a gift in support of IINE’s mission click here. 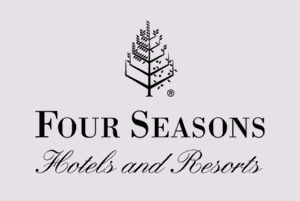 A student from Morocco in IINE’s Hospitality Training Program shadowed a Four Seasons housekeeping employee back in 2009, was hired, and still works at the hotel today. Success stories like this, of newcomers gaining independence in America, are repeated every time a local business partners with the Institute. 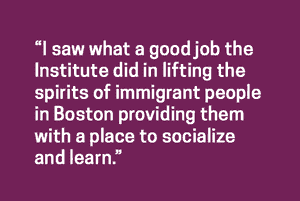 For more than a decade, the Four Seasons Hotel Boston has partnered with IINE-Boston’s Hospitality Training Program to help open doors for immigrants and refugees interested in a career in the hospitality industry. The program includes four intensive weeks of customer service training and an orientation to the hospitality industry provided by IINE-Boston Skills Training Instructors, followed by a two-week internship that pairs individuals with hotel employees in housekeeping, client services, catering, and various other departments. Securing a job and advancing a career are important steps on the pathway to self sufficiency for immigrants and refugees. To learn more about business partnership opportunities, follow the link below to contact the appropriate department at IINE. Michele Ross first joined IINE as an intern through her master’s degree program in peace and conflict studies. She was later hired as the Boston site’s Office Manager. In both roles, she has been committed to doing “transformative” work with refugee populations escaping violent conflict in their countries of origin in search of safety in the United States. As an intern, Michele provided intake interviews for clients recently granted asylum and helped clients apply for public benefits, social security, and the Masshealth health insurance program. She also taught the Boston site’s Cultural Orientation Program for newly arrived refugees, which she continues in her current role. She also helps make sure clients arrive at their appointments and classes on time, fields questions about cultural differences and customs, and provides orientation to day-to-day tasks including how to mail a letter, open a bank account, access food banks, and find warm clothing. Volunteers and interns are integral parts of fulfilling the Institute’s mission. To learn more about opportunities, follow the link below.